Boasting a drama figure on top of the riser this award trophy will be a crowd pleaser. 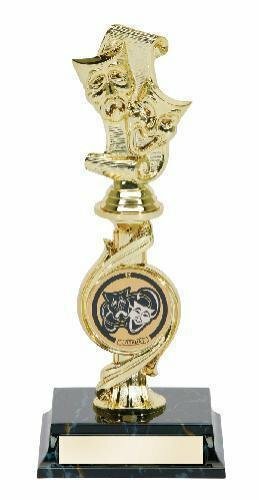 The dynamic Mylar holder is shown with a classic happy / sad mask Mylar but the holder also allows you the flexibility to give this award trophy for a wide variety of different occasions by just putting in a new insert. The award stands 10 3/4" and has plenty of room for whatever your personalization needs might be. 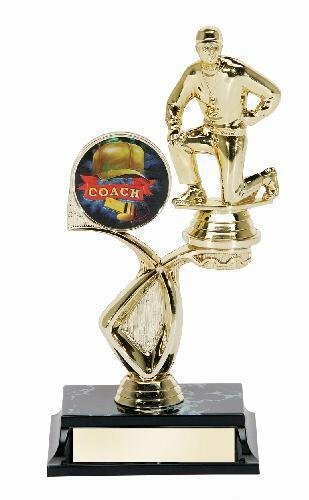 Drama Figure with Mylar Riser 10 3/4"
The green grass of the gridiron and a full color football set off the middle of this award trophy. The runner with the football charging for a touchdown tops of this award trophy. While, the black marble color finished base brings it all together. 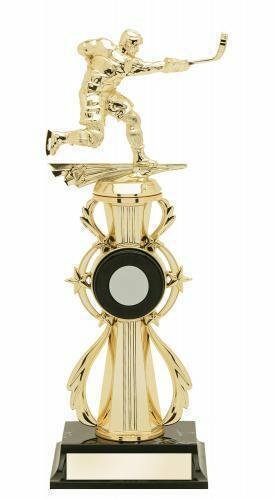 The football all star figure that tops this trophy is in full running motion with the ball as if running for the end zone. The full color football in the middle of the riser sets a dynamic tone for the overall award. The black marble color finish base completes this award trophy. The football multi-action figure that tops this trophy is shown with the quarterback getting ready to throw the game winning touchdown pass and the other shows a player with the ball tucked tightly under his arm running for the end zone. The mega star riser sets a dynamic tone for the overall award. The award stands 12 1/4" tall and has plenty of room on the base for whatever your personalization needs might be. After you have added this item to your cart, you can modify any of the parts for any sporting or academic activity. This trophy is perfect for any of your football needs.